Learn Portuguese in Lisbon at our partner school, CIAL. CIAL has been offering high quality Portuguese language courses for over 30 years, combining flexibility, competence and friendliness. The language school is situated in the heart of Lisbon close to the Parque Eduardo VII. Alternatively many students enjoy exploring the city alone or with a group of fellow students. There is so much to see and do in Lisbon that the problem is being able to fit it all in! Learn Portuguese in Lisbon by taking an intensive Portuguese course. The intensive course in Lisboa involves 15 lessons per week (minimum course length 1 week). Personal attention is guaranteed as the classes do not have more than 8 students. You can also choose to do an intensive course of 25 lessons which consists of 3 lessons of general Portuguese tuition combined with two workshops in the afternoon per day. The workshops focusses on specific topics like vocabulary, conversation, presentation, etc. Airport transfer on arrival at Lisbon. In 2019 the school is closed on 01/01/2019, 19/04/2019, 01/05/2019, 10/06/2019, 15/08/2019, 01/11/2019, 25/12/2019. Only one to one lessons are being rescheduled. The special intensive Portuguese course in Lisbon is an intensive course of 15 group lessons per week combined with 5 or 10 extra individual lessons with a private teacher. The total amount of lessons of your course is therefore either 20 or 25 lessons. The extra private classes are adapted to suit the student’s needs and knowledge level, and they can study something of interest or something that they are struggling with. 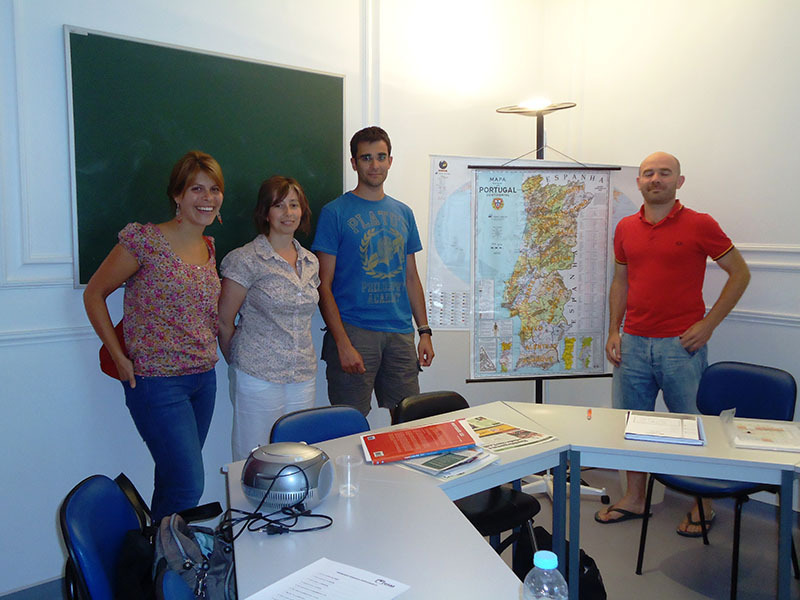 The Portuguese teacher course is aimed at those who teach Portuguese as a foreign language. The duration of the course is 2 weeks with 6 daily lessons in a maximum group of 8 people. The Portuguese teacher course allows you to perfect your Portuguese, revise fundamental aspects of the language and learn new didactic techniques for teaching Portuguese. In Lisbon you can combine your Portuguese language course of 15 lesson per week with surf lessons. During the course of 2 weeks, you have 15 language lessons per week and 5 surf lessons in total (divided over 5 afternoons). Each surf lesson is about 2.5 to 3 hours (including transportation to and from the beach). If you choose to do the course for 4 weeks, you will have 10 surf lessons in total. Then the surf lessons are being divided over 10 afternoons respectively. The exact days depend on weather and sea conditions and are being determined on location. The surf lessons are being organised by professional teachers who are recognised by the Portuguese Surf Federation. Transport and equipment are included. It is possible to book more surf lessons by paying a supplement, see price list. Surf lessons can be provided from April until September. This course includes transportation to and from the beach and the necessary equipment. The 2-week course Portuguese & surf includes 15 Portuguese lessons per week, and 5 surf lessons divided over 2 weeks. The course with a duration of 4 weeks includes 10 surf lessons divided over 4 weeks. Extra surf lessons: € 35 per lesson. The one-to-one Portuguese course in Lisbon is adapted to suit the interests and personal needs of the student. The individual Portuguese course consists of 20 lessons per week. It is also possible to take a semi-individual Portuguese course for 2 people who have the same standard of Portuguese and who are travelling together. To request more hours, a semi-individual course or to find out more about what’s on offer please contact us. Would you like to have an Easter break, then we can recommend a language course in Lisbon. The course starts on 30 March. Apart from the language classes you will have enough free time to explore Lisbon and enjoy the impressive processions during Semana Santa (Holy Week). During this two-week course the language lessons will focuss on oral communication skills, with intensive practice.The classes consist of up to 12 people. At our partner school in Lisbon you can enjoy a Portuguese language course during the Christmas season. In this two-week course you will be immersed in the Portuguese language, culture and Christmas spirit! You have enough free time to visit one of the Christmas markets or attend a Christmas Mass. If you want to have a unique glimpse into the life of the Portuguese during the holidays, we advise you to stay with a host family. You can stay in a host Portuguese family in a single room with bed and breakfast. You can also stay in a double room when traveling together with another person. The families are carefully selected so they are 15-30 minutes from the school by public transport. You can practice your Portuguese with family members after school. In Lisbon you can choose to stay in a shared apartment. You will share the common areas such as the bathroom, kitchen and lounge with other students from the language school. You can choose between a single or a double room. The apartments have wifi and a washing machine. This residence is available from July to August and offers high quality single rooms. The residence is located a mere 10 minutes from the school on foot, in a nice area with shops, restaurants and bars. Each room has its own balcony and bathrooms are shared between several students. There is WiFi throughout and your room is cleaned weekly. Linen (bed and towels) are also changed on a weekly basis. You will also have access to a lounge with cable TV and snooker, a fully-equipped kitchen, the laundry room (machines usable for a fee) and a terrace with a barbecue. There is no better way to learn a language than in the county, immersing yourself in the culture, food, music, lifestyle etc. There is no better way to learn a language than in the county, immersing yourself in the culture, food, music, lifestyle etc. of the local people. I adored my time in Portugal and am already planning another study abroad course for next year.